Kauai is an island full of splendor, raw beauty, and culture; an island that represents the true spirit of aloha like no other. A trip to Kauai is truly like a journey back in time to the beginning of the main Hawaiian chain. Here you'll find legends and lore, cliffs and coral reefs, and some of the most enchanting lands you'll ever visit. Kauai is dubbed the "Garden Isle" and no nickname could be more befitting. It is by far the "greenest" of the islands and the most lush in all of Hawaii. This jungle-like island paradise can attribute its climate to the trade winds that blow over the land, thereby allowing the ancient volcanic peaks to catch rain from the sky and pull it down to the earth below. Looking for the best beach, an even better hike, and the coziest bed and breakfast you've ever seen? Then look no further. Plus, you'll want to check out our selection of handpicked tours and adventures; whether you're an extreme adventurer or an "extreme" golf enthusiast, we have the perfect Kauai getaway for you. Plan, book, and go with Hawaii Guide. Truth be told, all of Kauai is remarkable. However, some Kauai attractions are incredibly popular because they offer an experience that truly captures the magical essence of Kauai. Most Inspirational, Must-See, Top Picks, Best of Kauai... no matter what you label them, you absolutely must witness these attractions for yourself. Let's be honest: all of Kauai is fabulous. But each area offers different attractions, sights, and things to do. 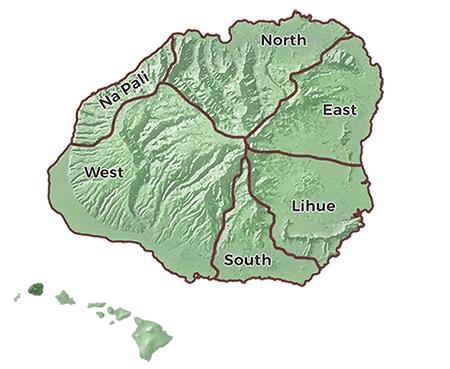 Explore Kauai's regions from afar here and find the spot that's best for you. Fun things to do, the oh-so-amazing NaPali Coast, and insider tips and advice to make your Kauai vacation simply spectacular. 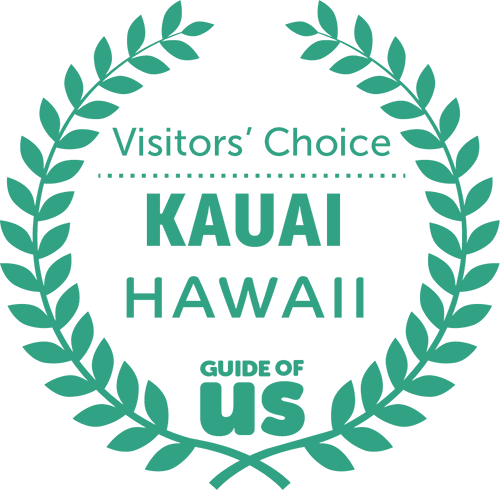 Our Visitors' Choice Awards are presented to those organizations, destinations, accommodations, and tour providers that meet the highest quality travel and tourism standards in Hawaii. Read more about our coveted travel awards here. Download the Apple App Now! Download the Android App Now! Our Guide's Choice Award is our most distinguished award, presented annually to Hawaiian tourism-related companies that are handpicked by our travel experts. The Guide's Choice Award is presented across two tiers within the state of Hawaii: county (e.g. ; Kauai) and statewide. This past fall, Guide of US and Hawaii Guide carefully handpicked and nominated a limited and exclusive group of Kauai tourism-related candidates for the upcoming year's Guide's Choice on Kauai. Each Guide's Choice Award on Kauai includes a yearly timestamp to distinguish the annual interval of the award. Nominees can receive the Guide's Choice year after year, on an annual basis. Here you'll find our most recent articles to keep you in the know about everything the Garden Isle offers.